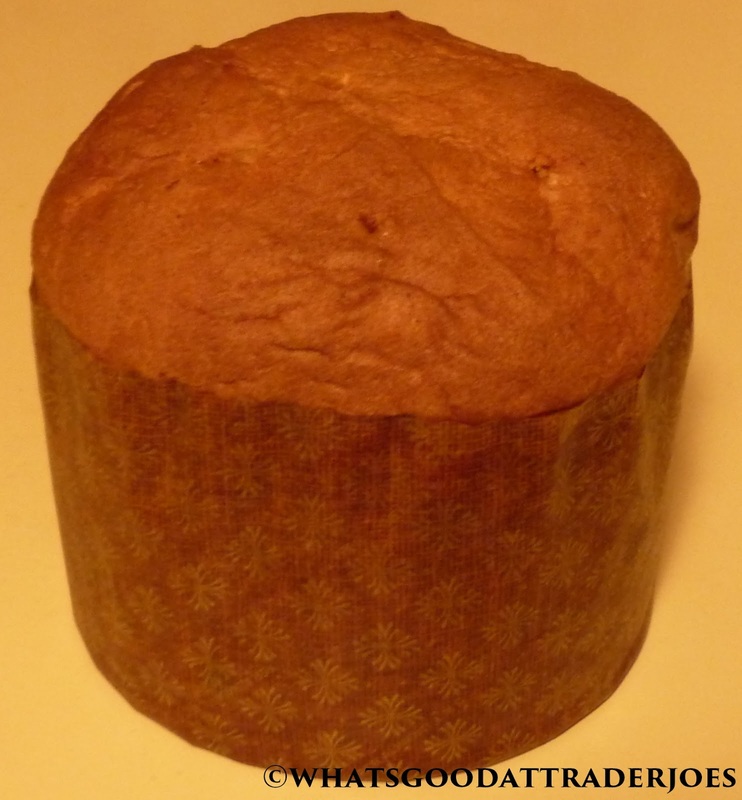 This is actually the second panettone we've reviewed here on WG@TJ's. The first one—the Panettone Classico—was much smaller than this selection, and it was offered around Christmas time. The write-up on the packaging for this unique product mentions that it's also eaten traditionally by Italians at Christmas time. Strangely, this offering is brought to us by the one and only Trader Joe, while the aforementioned "classico" selection was brought to us by "Trader Giotto." 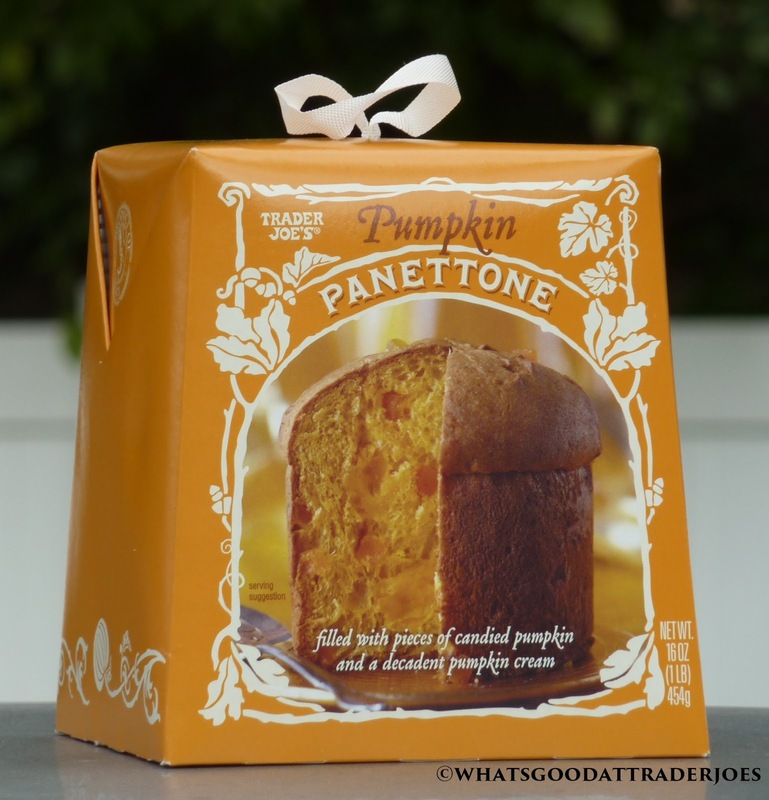 I erroneously assumed the discrepancy was due to the classico coming from Italy and the pumpkin version coming from here in the US. In fact, both products state plainly "Product of Italy" on their respective boxes. Speaking of the boxes, wow! HELLO packaging! Not only is this thing huge (much larger than its classico cousin), but it's also beautiful and ornate. In fact, there are little loops at the tops of the boxes in case one is inclined to use them as decorations. 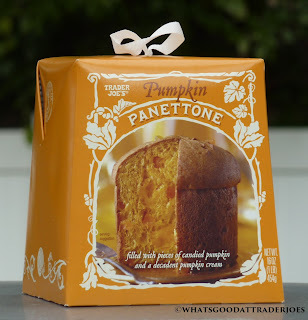 But if you do wait until the yuletide season to purchase a pumpkin panettone, I'd warn you not to hang the unopened box on your Christmas tree, as it is likely to bring the whole thing crashing down. At a full pound, this treat from the old country serves eight and is densely packed with "pumpkin flavored filling cream" and pieces of candied pumpkin. For about $5, it's perfect for parties or holiday gatherings, but when it's just you and maybe one other person, be prepared to open and close the packaging several times, as you'll never be able to eat this thing in one sitting. And be prepared for a struggle each time you open and close the package. In addition to the large, bell-shaped outer box, there's a big cellophane bag with a twist-tie and an oversize paper muffin cup around the cake itself. Serving yourself a slice of this dessert is rather like breaking into Fort Knox. And as soon as you open it, there's a peculiar smell that's hard to describe. One might say it's a citrusy, fermented kind of fragrance. 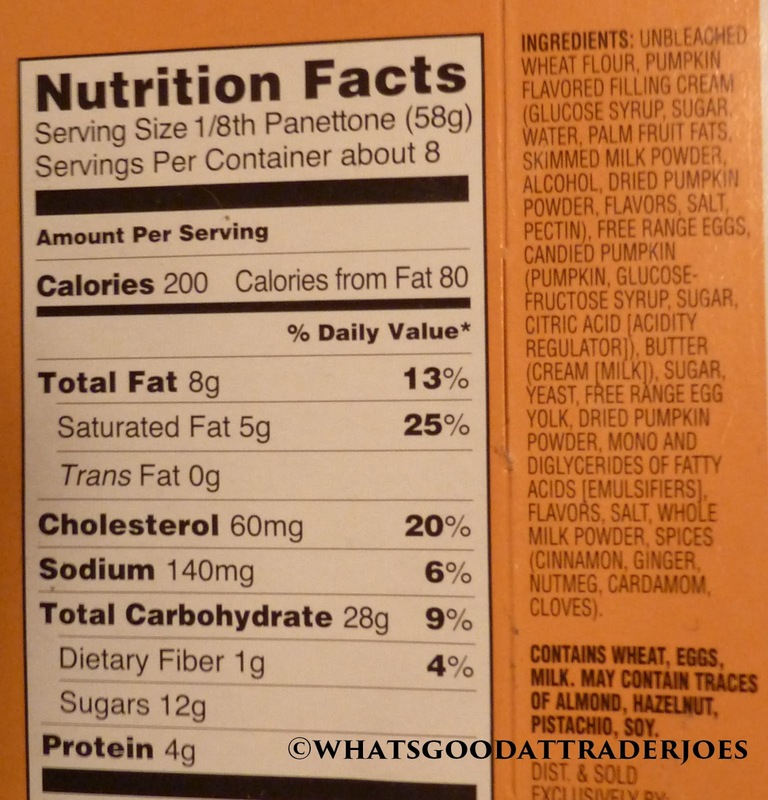 It's undoubtedly from the pumpkin ingredients. Sonia wasn't as pleased with the candied pumpkin as she was with the creamy pumpkin stuff. I found them both to be equally unexpected and unusual. They both taste like actual pumpkin, but sweeter. They're not too heavy on the traditional pumpkin spices like cinnamon and nutmeg. 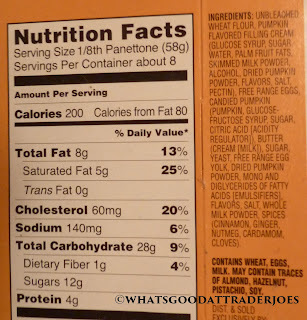 I thought the candied pumpkin was similar to any dried fruit you might find in a dessert like this. Sonia thinks they should have added pumpkin seeds to take the place of nuts, like you might find in a similar product. 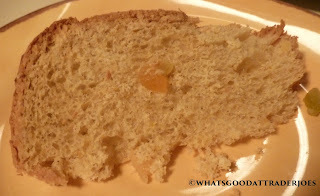 We both wholeheartedly agree that the best part of this product is the soft, fluffy cake bread. It's almost like angel food cake, but slightly more bread-like. It tastes and feels incredibly fresh. In fact, I can't figure out how a shelf-stable, pre-packaged product like this one—one that's been imported from Europe, no less—can flaunt such perfectly soft bread. Well, actually...I take that back. The three hefty layers of packaging might have something to do with it. But still...the freshness of this bread is impressive. I can't say the pumpkin cream and candied pumpkin were entirely appetizing to me, primarily because I'm not used to them. Sonia was even more weirded out than I was. But in the end, I have to admit that I'm glad we purchased this uncommon Italian holiday dessert treat, because I'm all about trying new things, even if they don't blow me away at first bite. This is the sort of thing I think might grow on me over time. And man, that fluffy breading is amazing. I can't go lower than four out of five stars. Sonia wants more pumpkin cream, less ginger flavor (I barely noticed the ginger in this product), and the addition of pumpkin seeds in version 2.0. Three and a half stars from her. I can't help but wonder if this would make a good french toast. Thoughts? Oooh, my guess is no. I'm intrigued by this... sounds amazing. I actually purchased this for the express reason of making French toast because my family loves my panettone French toast - and it's amazing ... simply delightfully amazingly delicious! Agreed! They aren't as good as last year & not as good as the variety pack either. Was looking fwd to their return but ended up disappointed. The cookie part has an odd texture. Too crumbly maybe? Many of the ones in my pack broke as I took them out of the plastic.